Robert Piernock was born in Philadelphia, Pennsylvania in 1955, then moved to Massachusetts in 1970. He is married to the former Ruth Carter and has three children; Michael, Jason, and Katherine. His youngest son, Michael, is a source of immense pride to him, as he is also an EMT on the squad and is currently training to become a paramedic. Bob has a varied background ranging from Laboratory Technologist to Project Manager to Web Application Developer, and also has a master’s degree in Business. He has now returned to his roots as a Laboratory Technologist at Fairview Hospital in Great Barrington. 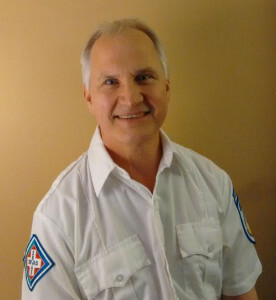 Bob initially trained as an EMT-Basic in 1985, and then as an EMT-Intermediate in 2013. He recently attained the level of Advanced EMT in 2015. Bob currently volunteers over 24 hours a month staffing the squad’s ambulances, and was recently nominated by his peers to the squad’s Board of Directors. This year, Bob is being recognized by his peers and Southern Berkshire’s Board of Directors as the Southern Berkshire Volunteer Ambulance Squad’s Volunteer of the Year. Bob is also being nominated as a Star because of his commitment to the squad and his exemplary leadership. For many years, Southern Berkshire had been struggling with problematic staffing, internal strife, and poor response times. Through his vision, leadership, and tenacity Bob brought the service to a new level of professionalism, and upgraded the level of care from EMT-Intermediate to Paramedic. Bob saw the upgrade through by hiring a new full-time Director of Operations to manage the service, added another ambulance to the fleet, and hired seven full-time paramedics. These actions enabled Southern Berkshire to successfully provide full-time paramedic emergency and non-emergency ambulance transport and paramedic intercept services to the largest service area in Southwestern Massachusetts. Previously this area relied on paramedic services from another city over 30 minutes away. In his time off, Bob enjoys playing his guitar and working with computers, but most of all, enjoys spending time with his family and volunteering for Southern Berkshire. He is truly deserving of this recognition. Bob is a true Star and represents one of the best that Massachusetts has to offer.